Crows are believed to be among the most intelligent, if not the smartest of birds. 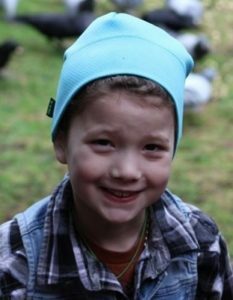 But what happened to an 8-year-old girl in Seattle, Washington shows that, unlike so many humans, crows recognize and are grateful for acts of kindness. It all began in 2011 when Gabi Mann first drew the attention of neighborhood crows. She was four years old and prone to dropping food. She’d get out of the car, and a chicken nugget would tumble off her lap. A crow would rush in to recover it. Soon, the crows were watching for her, hoping to catch the morsels of food that Gabi would drop. As Gabi grew older, she began to deliberately, instead of accidentally, feed the crows. On the way to the bus stop, she and her brother would share their packed lunches with the crows. Soon, crows were lining up in the afternoon to greet Gabi’s bus, hoping for another feeding session. In 2013, Gabi and Lisa started offering food as a daily ritual, rather than dropping scraps from time to time. Each morning, they fill the backyard birdbath with fresh water and cover bird-feeder platforms with peanuts. Gabi throws handfuls of dog food into the grass. As they work, crows assemble on the telephone lines, calling loudly to them. That was when the gifts began. 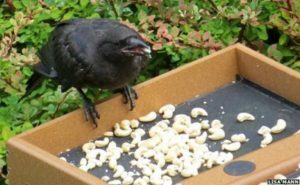 The crows would clear the feeder of peanuts, and leave shiny trinkets on the empty tray — an earring, a hinge, a polished rock, anything shiny and small enough to fit in a crow’s mouth. There wasn’t a pattern. Gifts showed up sporadically. The crows’ gifts include beads, rocks, buttons, paper clips and earrings. 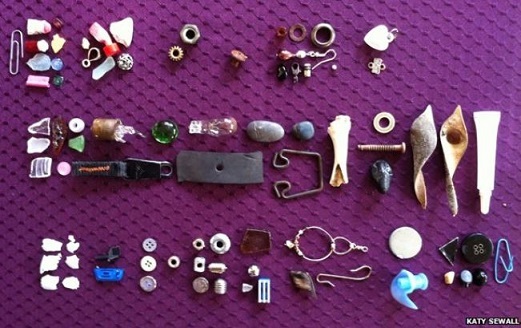 There’s a miniature silver ball, a black button, a blue paper clip, a yellow bead, a faded black piece of foam, a blue Lego piece, and the list goes on. Many of them are scuffed and dirty, but to Gabi they are more valuable than gold. Not all of the gifts are pretty trinkets. Gabi’s mom Lisa once had to dispose of a rotting crab claw that the crows brought. 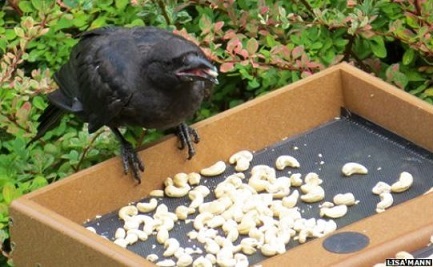 Marzluff, and his colleague Mark Miller, did a study of crows and the people who feed them. They found that crows and people form a very personal relationship. “There’s definitely a two-way communication going on there,” Marzluff says. “They understand each other’s signals.” The birds communicate by how they fly, how close they walk, and where they sit. The human learns their language and the crows learn their feeder’s patterns and posture. They start to know and trust each other. Sometimes a crow leaves a gift. According to the National Audubon Society, crows are one of the few bird species that have been documented to recognize individual human faces. This entry was posted in Animal gratitude, Animals, God's creation and tagged Gabi Mann, John Marzluff, Lisa Mann. Bookmark the permalink.